Release: FORMER DIOCESAN RURAL LIFE DIRECTOR Born in Hamilton on Feb. 14, 1967, to Keith and Norma Jean Ketcham, he was raised as a member of St. Mary Church in Hamilton. Msgr. Ketcham was graduated from Hamilton High School in 1985 and earned a bachelor’s degree in philosophy from Immaculate Heart of Mary Seminary in Winona, Minnesota, in 1989. He completed studies for the priesthood at St. Mary of the Lake Seminary, Mundelein, from which he earned a master of divinity degree and a degree in sacred theology. Msgr. Ketcham was ordained by Bishop John J. Myers at St. Mary’s Cathedral in Peoria on May 28, 1994. His first assignment was as parochial vicar of Immaculate Conception, Monmouth; St. Patrick, Raritan; and St. Andrew, Oquawka. He would serve those faith communities for three years. In 1995, he was named diocesan director of rural life, a post he would hold for eight years. From 1997 to 2003 he was pastor of Sts. Peter and Paul, Nauvoo, and Sacred Heart in Dallas City. 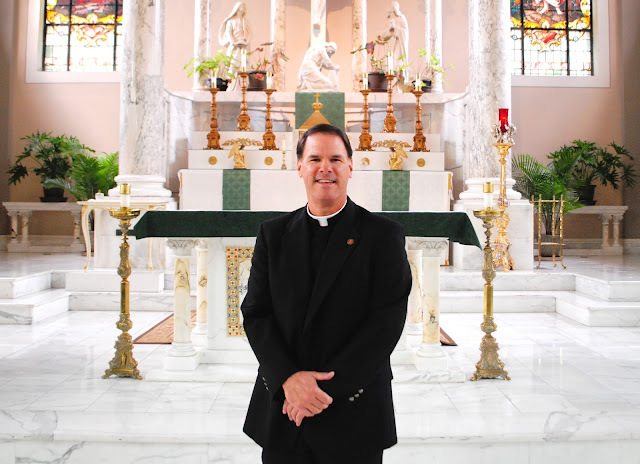 He then became pastor of St. Philomena, Peoria, where he would serve until his appointment to guide the Newman Center at the University of Illinois — the largest of its kind in the nation, serving a Catholic student population of more than 10,000 — in 2006. Among the highlights of his eight years of ministry at St. John’s Catholic Newman Center was the dedication and blessing in 2008 of a $38 million major expansion and renovation project, including a six-story addition that doubled the student resident capacity of Newman Hall. He was named a Chaplain to His Holiness with the title of monsignor in 2009. PEACE, FAITH THROUGH ILLNESS In 2014, Msgr. Ketcham was named pastor of St. Patrick Church of Merna in Bloomington and St. Mary, Downs. After suffering a seizure during a Sunday Mass on June 12, 2016, Msgr. Ketcham was diagnosed with a malignant brain tumor. The announcement led to an outpouring of support and prayers — including weekly vigils at St. Patrick Church of Merna — with Msgr. Ketcham keeping present and past parishioners updated on his condition via the parish website. “The Lord has given me great peace which is even more powerful than hope,” he wrote in his first entry on July 16, 2016, while undergoing treatment at MD Anderson Cancer Center in Houston. “I totally have submitted my life and priesthood into the hands of Jesus through the intercession of Venerable Archbishop Sheen, St. Patrick, St. John Bosco, and St. Dominic Savio.” He frequently closed his updates with a phrase of trust in Christ, which parishioners put on t-shirts: “Jesus reigns.” Msgr. Ketcham returned to the Bloomington and Downs parishes that September. He was named pastor emeritus last April. EDITOR’S NOTE: Survivor and memorial information will be added to this obituary as it is made known. BLOOMINGTON — A Mass of Christian Burial will be celebrated at 11 a.m. on Monday, Feb. 12, at St. Patrick Church of Merna here for Msgr. Gregory K. Ketcham, 50, pastor emeritus of St. Patrick Church of Merna and St. Mary, Downs. Msgr. Ketcham, a native of Hamilton whose assignments included eight years as chaplain and director at St. John’s Catholic Newman Center at the University of Illinois, died early Thursday morning, Feb. 8, 2018, in the rectory of St. Patrick Church of Merna Parish. His death came nearly 20 months after he had been diagnosed with brain cancer. Bishop Daniel R. Jenky, CSC, will be principal celebrant of the funeral Mass, with Father James J. Seitz, a priest of the Diocese of Winona, as homilist. There will be a viewing of the body from 1 to 4 p.m. on Sunday, Feb. 11, at St. Patrick of Church of Merna, 1001 N. Towanda Barnes Road. A visitation will take place at the church from 4 to 7 p.m., concluding with recitation of the rosary. An additional visitation is scheduled from 9 to 10:45 a.m. on Monday prior to the funeral Mass. A second visitation is planned from 9 to 11 a.m. on Tuesday, Feb. 13, at Sts. Peter and Paul Church in Nauvoo. A funeral procession will then travel from Nauvoo to Hamilton along the Great River Road for a graveside service at Oakwood Cemetery in Hamilton, followed by a memorial Mass at noon in St. Mary Church, Hamilton. Rest in peace Father. God bless you. Condolences to your family.